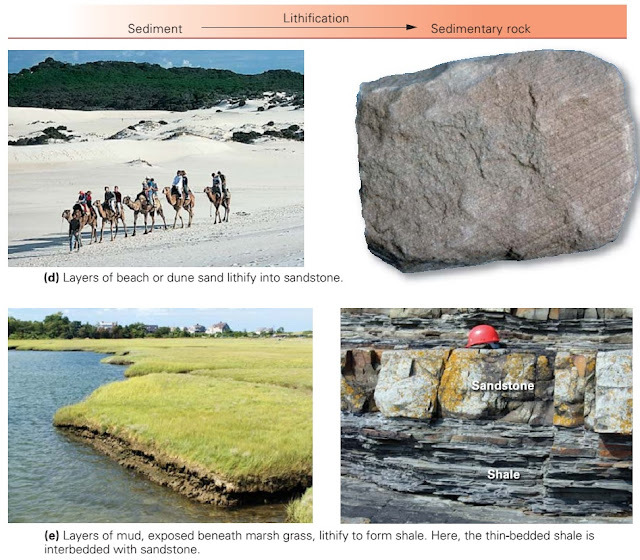 Geologists divide sedimentary rocks into four major classes, based on their mode of origin. (1) Clastic sedimentary rock consists of cemented-together clasts, solid fragments and grains broken off of preexisting rocks (the word comes from the Greek klastos, meaning broken); (2) biochemical sedimentary rock consists of shells; (3) organic sedimentary rock consists of carbon-rich relicts of plants or other organisms; and (4) chemical sedimentary rock is made up of minerals that precipitated directly from water solutions. Let’s now look at these major classes in more detail. Nine hundred years ago, a thriving community of Native Americans inhabited the high plateau of Mesa Verde, Colorado. In hollows beneath huge overhanging ledges, they built multistory stone-block buildings that have survived to this day. Clearly, the blocks are solid and durable they are, after all, rock. But if you were to rub your thumb along one, it would feel gritty, and small grains of quartz would break free and roll under your thumb, for the block consists of quartz sand grains cemented together. Geologists call such rock a sandstone. Sandstone is an example of clastic sedimentary rock. It consists of loose clasts, known as detritus, that have been stuck together to form a solid mass. The clasts can consist of individual minerals (such as grains of quartz or ﬂakes of clay) or of fragments of rock (such as pebbles of granite). Formation of sediment and its transformation into clastic sedimentary rock takes place via the following ﬁve steps. Weathering: Detritus forms by disintegration of bedrock into separate grains due to physical and chemical weathering. Erosion: Erosion refers to the combination of processes that separate rock or regolith (surface debris) from its substrate. Erosion involves abrasion, falling, plucking, scouring, and dissolution, and is caused by moving air, water, or ice. Transportation: Gravity, wind, water, or ice carry sediment. The ability of a medium to carry sediment depends on its viscosity and velocity. Solid ice can transport sediment of any size, regardless of how slowly the ice moves. Very fast-moving, turbulent water can transport coarse fragments (cobbles and boulders), moderately fast-moving water can carry only sand and gravel, and slow-moving water carries only silt and clay. Strong winds can move sand and dust, but gentle breezes carry only dust. Deposition: Deposition is the process by which sediment settles out of the transporting medium. Sediment settles out of wind or moving water when these fluids slow, because as the velocity decreases, the fluid no longer has the ability to carry sediment. Sediment is deposited by ice when the ice melts. Lithiﬁcation: Geologists refer to the transformation of loose sediment into solid rock as lithiﬁcation. The lithification of clastic sediment involves two steps. First, once the sediment has been buried, pressure caused by the weight of overlying material squeezes out water and air that had been trapped between clasts, and clasts press together tightly, a process called compaction. Compacted sediment may then be stuck together to make coherent sedimentary rock by the process of cementation. Cement consists of minerals (commonly quartz or calcite) that precipitate from groundwater and fill the spaces between clasts. Say that you pick up a clastic sedimentary rock and want to describe it sufﬁciently so that, from your words alone, another person can picture the rock. What characteristics should you mention? Geologists ﬁnd the following characteristics most useful. Clast size. Size refers to the diameter of fragments or grains making up a rock. Names used for clast size, listed in order from coarsest to finest, are: boulder, cobble, pebble, sand, silt, and clay. Clast composition. Composition refers to the makeup of clasts in sedimentary rock. Clasts may be composed of rock fragments or individual mineral grains. Angularity and sphericity. Angularity indicates the degree to which clasts have smooth or angular corners and edges. Sphericity, in contrast, refers to the degree to which the shape of a clast resembles a sphere. Sorting. Sorting of clasts indicates the degree to which the clasts in a rock are all the same size or include a variety of sizes. Well-sorted sediment consists entirely of sediment of the same size, whereas poorly-sorted sediment contains a mixture of more than one clast size. Character of cement. Not all clastic sedimentary rocks have the same kind of cement. In some, the cement consists predominantly of quartz, whereas in others, it consists predominantly of calcite. With these characteristics in mind, we can distinguish among several common types of clastic sedimentary rocks. This table provides common rock names specialists sometimes use other, more precise names based on more complex classiﬁcation schemes. The size, angularity, sphericity, and sorting of clasts depends on the medium (water, ice, or wind) that transports the clasts and, in the case of water or wind, on both the velocity of the medium and the distance of transport. The composition of the clasts depends on the composition of rock from which the clasts were derived, and on the degree of chemical weathering that the clasts have undergone. Thus, the type of clasts that accumulate in a sedimentary deposit varies with location. 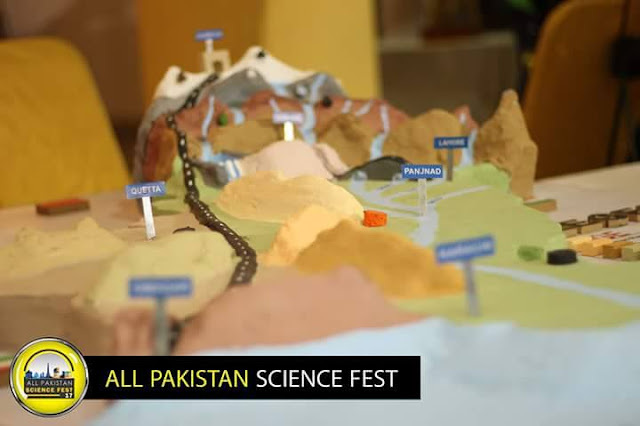 To see how, let’s follow the fate of rock fragments as they gradually move from a cliff face in the mountains via a river to the seashore. Different kinds of sediment develop along the route. Each kind, if buried and lithiﬁed, would yield a different type of sedimentary rock. becomes quartz sandstone (d figure below). Meanwhile, silt and clay may accumulate in the ﬂat areas bordering streams, regions called ﬂoodplains that become inundated only during ﬂoods. And some silt and mud settles in a wedge, called a delta, at the mouth of the river, or in lagoons or mudﬂats along the shore. The silt, when lithiﬁed, becomes siltstone, and the mud, when lithiﬁed, becomes shale or mudstone (e figure below). Rocks The Earth System involves many interactions between living organisms and the physical planet. Numerous organisms have evolved the ability to extract dissolved ions from seawater to make solid shells. When the organisms die, the solid material in their shells survives. This material, when lithiﬁed, comprises biochemical sedimentary rock. 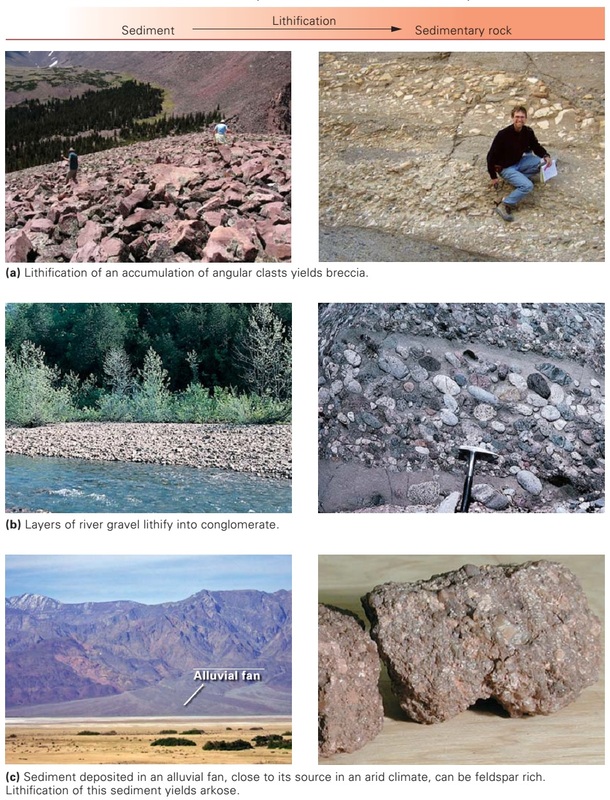 Geologists recognize several different types of biochemical sedimentary rocks, which we now describe. A snorkeler gliding above a reef sees an incredibly diverse community of coral and algae, around which creatures such as clams, oysters, snails (gastropods), and lampshells (brachiopods) live, and above which plankton ﬂoat (a figure above). Though they look so different from each other, many of these organisms share an important characteristic: they make solid shells of calcium carbonate (CaCO3). The CaCO3 crystallizes either as calcite or aragonite. (These minerals have the same composition, but different crystal structures.) When the organisms die, the shells remain and may accumulate. Rocks formed dominantly from this material are the biochemical version of limestone. Since the principal compound making up limestone is CaCO3, geologists refer to limestone as a type of carbonate rock. Limestone comes in a variety of textures, because the material that forms it accumulates in a variety of ways. For example, limestone can originate from reef builders (such as coral) that grew in place, from shell debris that was broken up and transported, from carbonate mud, or from plankton shells that settled like snow out of water. Because of this variety, geologists distinguish among fossiliferous limestone, consisting of visible fossil shells or shell fragments (b figure above); micrite, consisting of very ﬁne carbonate mud; and chalk, consisting of plankton shells. Experts recognize many other types as well. Typically, limestone is a massive light-gray to darkbluish-gray rock that breaks into chunky blocks it doesn't look much like a pile of shell fragments (c figure above). That’s because several processes change the texture of the rock over time. For example, water passing through the rock not only precipitates cement but also dissolves some carbonate grains and causes new ones to grow. If you walk beneath the northern end of the Golden Gate Bridge in California, you will find outcrops of reddish, almost porcelain-like rock occurring in 3- to 15-cm-thick layers (a figure above). Hit it with a hammer, and the rock would crack to form smooth, spoon-shaped (conchoidal) fractures. Geologists call this rock biochemical chert; it’s made from cryptocrystalline quartz (crypto is Greek for hidden), meaning quartz grains that are too small to be seen without the extreme magnification of an electron microscope. The chert beneath the Golden Gate Bridge formed from the shells of silica-secreting plankton that accumulated on the sea floor. Gradually, after burial, the shells dissolved, forming a silica-rich gel. Chert then formed when this gel solidified. We've seen how the mineral shells of organisms (CaCO3 or SiO2) can accumulate and lithify to become biochemical sedimentary rocks. What happens to the “guts” of the organisms the cellulose, fat, carbohydrate, protein, and other organic compounds that make up living matter? Commonly, this organic debris gets eaten by other organisms or decays at the Earth’s surface. But in some environments, the organic debris settles along with other sediment and eventually gets buried. When lithiﬁed, organic-rich sediment becomes organic sedimentary rock. Since the dawn of the industrial revolution in the early 19th century, coal, one type of organic sedimentary rock, has provided the fuel of modern industry and transportation, for the organic chemicals in the rock yield energy when burned. Coal is a black, combustible rock consisting of over 50 to 90% carbon. The remainder consists of oxygen, nitrogen, hydrogen, sulphur, silica, and minor amounts of other elements. Typically, the carbon in coal occurs in large, complex organic molecules made of many rings note that the carbon does not occur in CaCO3. Coal forms when plant remains have been buried deeply enough and long enough for the material to become compacted and to lose signiﬁcant amounts of volatiles (hydrogen, water, CO2, and ammonia); as the volatiles seep away, a concentration of carbon remains (b figure above). The colourful terraces, or mounds, that grow around the vents of hot-water springs; the immense layers of salt that underlie the ﬂoor of the Mediterranean Sea; the smooth, sharp point of an ancient arrowhead these materials all have something in common. They all consist of rock formed primarily by the precipitation of minerals from water solutions. We call such rocks chemical sedimentary rocks. They typically have a crystalline texture, partly formed during their original precipitation and partly when, at a later time, new crystals grow at the expense of old ones through a process called recrystallization. In some examples, crystals are coarse. In others, they are too small to see. Geologists distinguish among many types of chemical sedimentary rocks, primarily on the basis of composition. 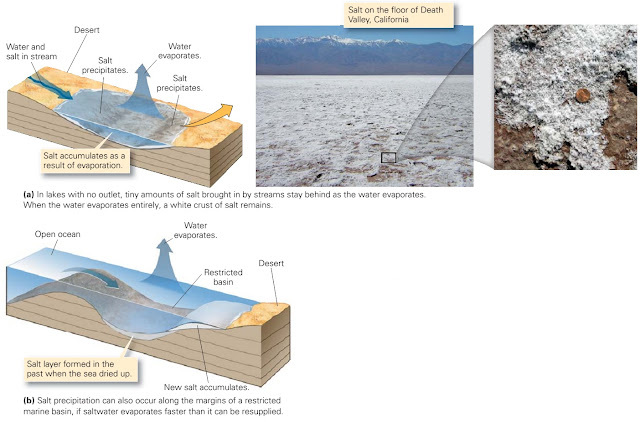 Evaporites: the products of salt-water evaporation. In 1965, two daredevil drivers in jet-powered cars battled to be the ﬁrst to set the land speed record of 600 mph. On November 7, Art Arfons, in the Green Monster, peaked at 576.127 mph; but eight days later Craig Breedlove, driving the Spirit of America, reached 600.601 mph. Travelling at such speeds, a driver must maintain an absolutely straight line; any turn will catapult the vehicle out of control. Thus, high-speed trials take place on extremely long and ﬂat racecourses. Not many places can provide such conditions the Bonneville Salt Flats of Utah do. The salt ﬂats formed when an ancient salt lake evaporated. Under the heat of the Sun, the water turned to vapour and drifted up into the atmosphere, but the salt that had been dissolved in the water stayed behind. Salt precipitation occurs where salt-water becomes supersaturated, meaning that it has exceeded its capacity to contain more dissolved ions. In supersaturated salt-water, ions bond to form solid grains that either settle out of the water or grow on the ﬂoor of the water body. Supersaturated salt-water develops where evaporation removes water from a water body faster than the rate at which new water enters. This process takes place in desert lakes and along the margins of restricted seas (figure above). For thick deposits of salt to form, large volumes of water must evaporate. Because salt deposits form as a consequence of evaporation, geologists refer to them as evaporites. The speciﬁc type of salt minerals comprising an evaporite depends on the amount of evaporation. When 80% of the water evaporates, gypsum forms; and when 90% of the water evaporates, halite precipitates. Travertine is a rock composed of crystalline calcium carbonate (CaCO3) formed by chemical precipitation from groundwater that has seeped out at the ground surface either in hot- or cold-water springs, or on the walls of caves. What causes this precipitation? It happens, in part, when the groundwater degasses, meaning that some of the carbon dioxide that had been dissolved in the groundwater bubbles out of solution, for removal of carbon dioxide encourages the precipitation of carbonate. Precipitation also occurs when water evaporates, thereby increasing the concentration of carbonate. Various kinds of microbes live in the environments in which travertine accumulates, so biologic activity may also contribute to the precipitation process. Travertine produced at springs forms terraces and mounds that are meters or even hundreds of meters thick, such as those at Mammoth Hot Springs (a in figure above). Travertine also grows on the walls of caves where groundwater seeps out (b in figure above). In cave settings, travertine builds up beautiful and complex growth forms called speleothems. Another carbonate rock, dolostone, differs from limestone in that it contains the mineral dolomite (CaMg[CO3]2), which contains equal amounts of calcium and magnesium. Where does the magnesium come from? Most dolostone forms by a chemical reaction between solid calcite and magnesium-bearing groundwater. Much of the dolostone you may ﬁnd in an outcrop actually originated as limestone but later changed into dolostone as dolomite crystals replaced calcite. This change may take place beneath lagoons along a shore soon after the limestone formed, or a long time later, after the limestone has been buried deeply. Chert comes in many colours (black, white, red, brown, green, gray), depending on the impurities it contains. Petriﬁed wood is chert that forms when silica-rich sediment, such as ash from a volcanic eruption, buries a forest. The silica dissolves in groundwater, and then later precipitates as cryptocrystalline quartz within wood, gradually replacing the wood’s cellulose. The chert deposit retains the shape of the wood and the growth rings within it. Some chert, known as agate, precipitates in concentric rings inside hollows in a rock and ends up with a striped appearance, caused by variations in the content of impurities incorporated in the chert (b in figure above). We are providing highly pure and utmost quality of uncoated Calcium Carbonate Precipitated series that meets the current standard and norms of polymer Industry’s requirement.